Starting in the beginning of November, a mall about forty-five minutes from us began their Santa visits. I know. NOVEMBER. That alone is crazy. But skip the lecture and stay with me. Except in this particular mall, Santa was superfluous. Santa was the afterthought. 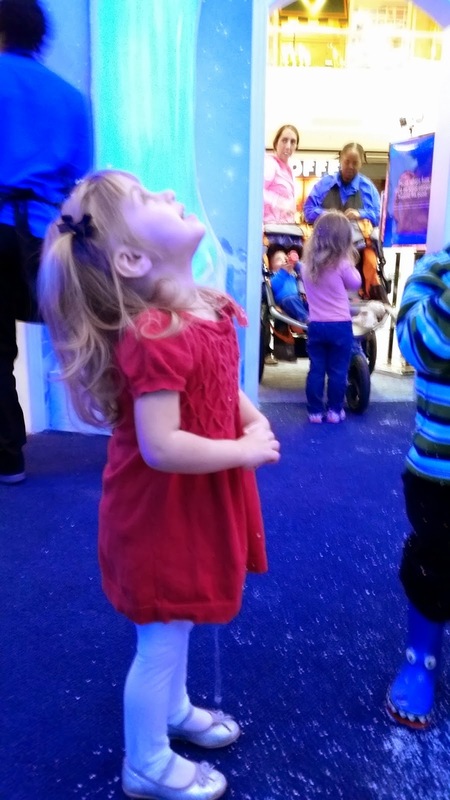 What this mall was really focusing on was the Frozen experience. There was a day in early November where my Facebook newsfeed was completely full of people sharing the article that this special Frozen experience was coming. The week it opened, the lines were three to four hours long. Three to four hours of standing in a line at the mall. Before Thanksgiving. That's what encouraged us to drive the forty-five minutes to the Frozen experience. As families go, we're pretty lucky. I stay home and homeschool the girls. Madison has activities up the wazoo all afternoon, but she's got a big chunk of open time most mornings and Reagan's schedule is free as a bird (as a two year old should be). Adam works from home with a fairly flexible schedule. Unless he's on a scheduled call, if we have something we'd like to do as a family during the week, he'll get up early or work late, and we can usually swing it. This means that we didn't need to brave this particular experience on a weekend or after school hours. We could go on a Monday morning as soon as they opened. So that's what we did. We went the day before Reagan's surgery, since we weren't sure how long her recovery would be or how overwhelmed we'd be mid-December. We would never dream of doing something like this before Thanksgiving most years, but we rationalized that we really weren't interested in the Santa portion. We weren't even sure if Santa was always there on weekdays. We just wanted the castle without having to wait and we figured a November Monday at opening was the best time. We did - unbelievably - still have to wait in line, but we were about fifteenth and our line was only about twenty minutes. Totally doable. The experience itself? Well, if we'd waited three hours, or if Adam and I were basing it on our experience, was pretty disappointing. It was a pretty ice castle structure, but there were no characters, no interaction, no real "experiences". You walked through a blue and white path with about seventeen TVs playing the sing along version of the movie. 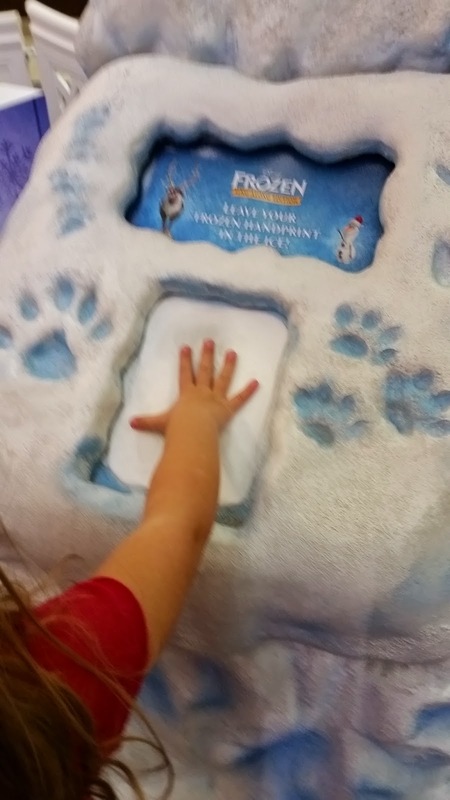 You could make a print in a block of ice with your hand (and then watch it fade away) and stand up against a cutout of Olaf and Sven to see how tall you were. 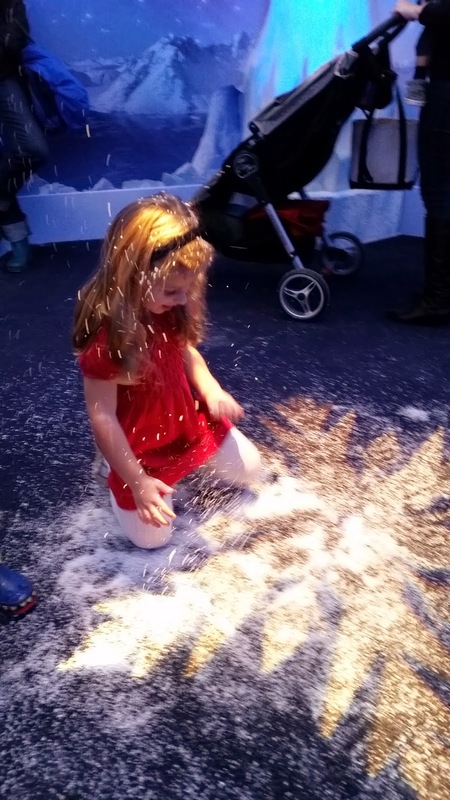 As you reached the center of the castle, there was snow falling from the ceiling and you were free to dance and play and get your hair full of fake snow while your parents waited around the edges. Not much, but the girls loved it. 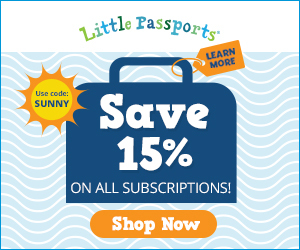 The things we'll do for our kids, right? So now we're at the big finish. As you walk through the path, you are helpfully handed the pamphlet with the photo pricing. Because, Mall Santa is not free. Ever. Anyone who is surprised by this has clearly been living under a rock. If you want to sit with Santa, it's going to cost you. And at this particular mall there were two possible places to pose. An ice throne with a stuffed Olaf, and of course, the big guy himself. It should be noted that you could bypass the photos and thrones altogether, exiting the castle without sitting anywhere. This would actually be free. And on this particular Monday, there were people who made that choice. 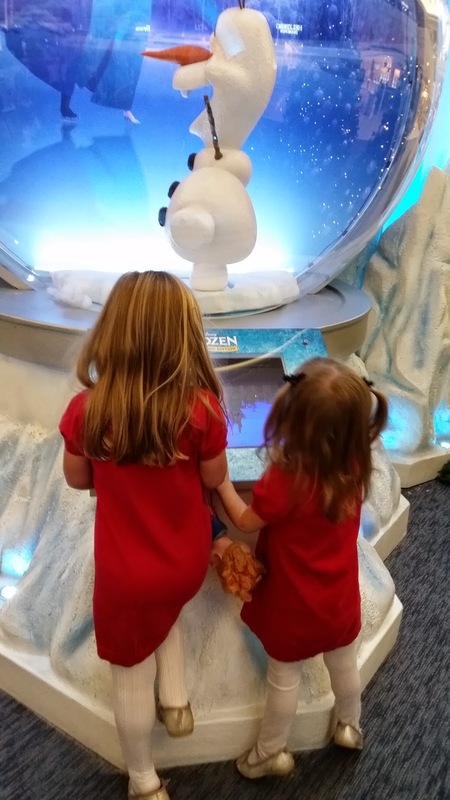 Well, naturally, the girls wanted onto that ice throne. Which, according to the pamphlet, was either a $10 add on to a Santa package or only included in the most expensive package (the employee we asked said ice castle only wasn't an option, although we found out later it was). As we exited the snowy castle we were told we had to make our package selection immediately so we'd know whether or not we'd be allowed to perch on the ice throne. We sucked it up, went with the obscenely expensive "package A", and rationalized that, at least, we were done with Santa photos. And that's where it all went wrong. Once we agreed to this package the girls were hustled to the ice throne. 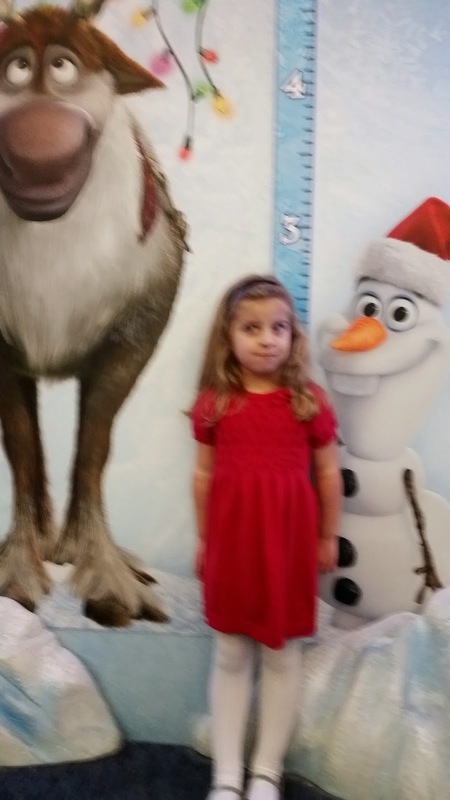 Reagan picked up one of the two small stuffed Olaf toys and was told to put it down. If you've ever said "no" to Reagan before, or really, pretty much any two year old, you probably know how that ended. She threw Olaf to the ground and began to yell. Another photo employee came up and corrected the first. Of course, kids were allowed to touch the stuffed toys. That's what they were there for. 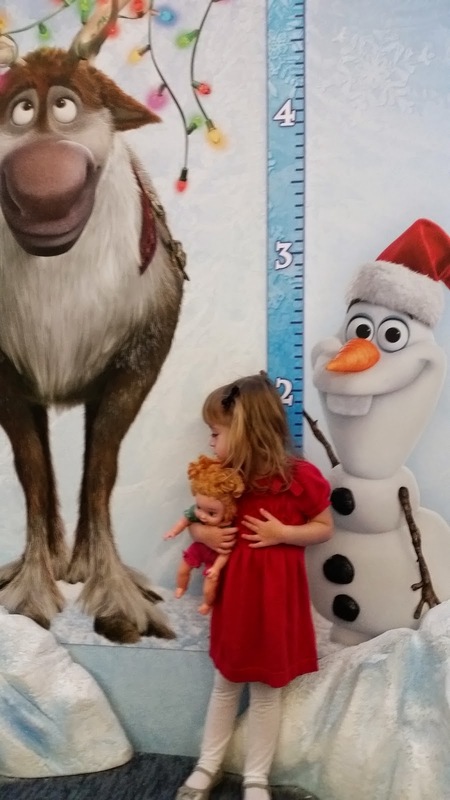 We tried to get Reagan to recover and snuggle with Olaf, but it wasn't happening. She had been morally wronged. Oh, and we were told we were holding up the line. So Madison sat alone. While no one took a picture. The young man at that particular throne stared at his computer and camera as if he had never seen one before. Reagan was getting itchier and itchier. Now she wasn't sitting on a throne, but nothing else was happening either. She wanted to run back into the snow room or leave. Finally, the man took Madison's picture and began printing the copy that he'd carry over to Santa. Once Madison had slid off the ice throne, Santa beckoned the girls over. 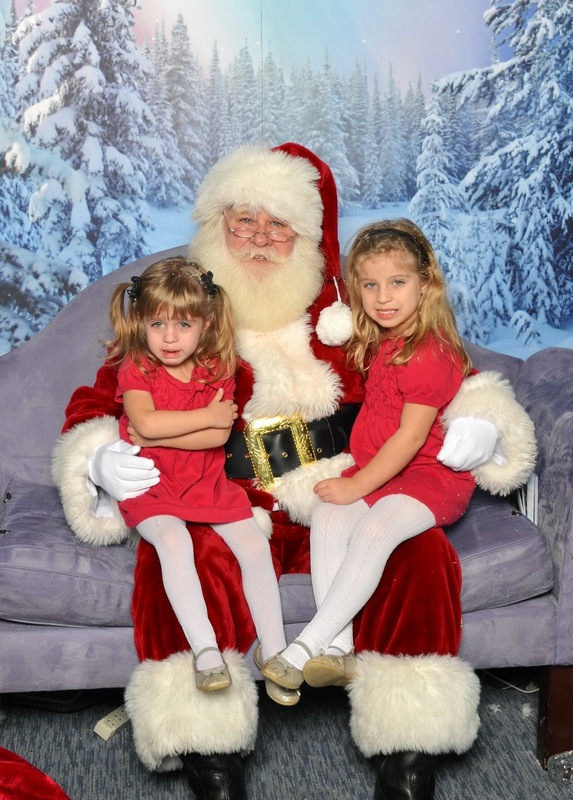 After asking the picture people if it was OK (and getting confirmation) both girls ran over to love Santa. And love him they did. Both girls ran up and were happy to perch right on his lap. Even Reagan, who had made a miraculous recovery from the previous injustice. They hugged Santa, and talked to Santa. Magical. And no one took a picture. Apparently, the woman before us had decided to give the photo staff a lecture in photography and fair pricing. She didn't want to buy her pictures because "one pose" wasn't quite the "quality standard" she'd set for herself and she would certainly never charge this much for an "unedited, posed" print. But rather than saying "no thank you", she was trying to make herself heard as the voice for change. For Mall Santa experiences everywhere! While (apparently) her kids pictures sat idle somewhere in the camera/computer matrix, prohibiting the staff from taking any further pictures until they either printed these or deleted them. Note to photographers: Of course she was right. Mall Santa pictures are not the standard you would set for yourself and they're obscenely overpriced. But it's kind of like telling the bus boy at a chain restaurant that you know how to make chicken and would never charge that much for a chicken breast and demand that he give you time for a full preparation and a deep discount. Not the right person, not the right time, and frankly, if you have such high standards, why are you there? 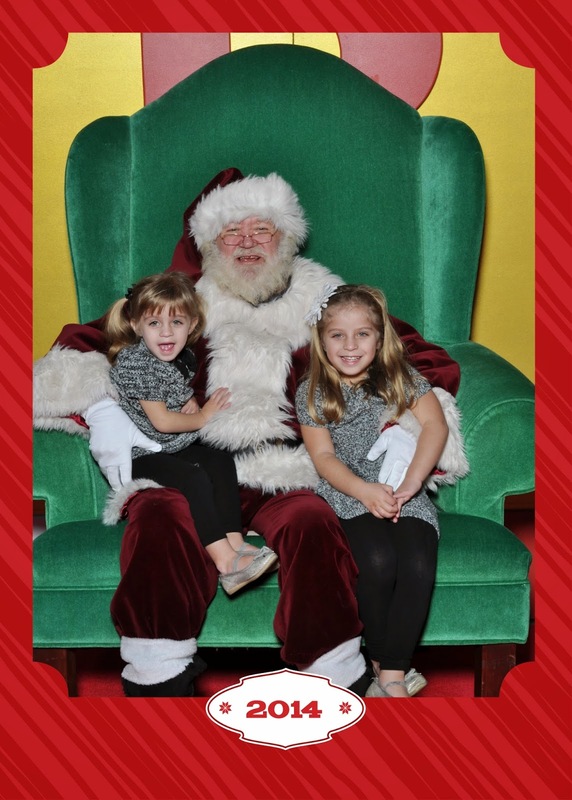 So while my kids were sitting, being cute, with Santa, no one took a picture. They sat for over five minutes, seven minutes, nearly ten minutes. When I asked why they'd been put there before the camera was ready I was told "because it would have held up the line to wait until the camera was ready". As we approached the ten minute mark, Reagan slipped down, cheerfully called goodbye, and ran over to me, saying "all done!". At this exact moment, Change the Santa Photo Experience Mom decided to leave without purchasing anything and they were ready to take our picture. I tried to send Reagan back to Santa. Santa himself, wonderful man that he is, pulled out a Frozen Look and Find book for each girl from his bag of goodies and tried to entice her over by asking her all about Frozen. She was starting to lose it. The photo people, now back into rush mode, told me I had to either put her on his lap or take her away. Calming her down was "holding up the line". I put Reagan on Santa's lap where she threw the Frozen book with a surprising amount of strength and power and did her pout/scream hybrid. And that is the picture they took. And naturally, we were committed to Package A. We'd sat on the Frozen Throne! We'd made the decision! No backsies! Madison had to pee, and I was about thiiiiiis close to screaming at the photo people, so Adam sent me off to the potty with the girls while he settled up. They handed him an envelope which they said contained everything. The prints from both thrones, the CD, the Shutterfly gift card. Adam met us in the Disney Store where we got the icky taste of that experience out of our systems by letting the girls have a tea party and decide on everything they wanted for Christmas (which turned out to be most of the inventory). We hit the Lego Store after that and Red Robin for lunch and went home feeling like, with one minor blip, it had been a great pre-surgery day. We got home, we went on with our day, and that evening I started cleaning out my bag to bring to the hospital. I opened the envelope. And that rage inducing Santa picture. Let me be clear. I am not a complainer in situations such as this. Sometimes these things are better in memory or on paper than they actually are. We've been disappointed before, but that's life. You learn, you move on. Food stinks at a restaurant? You don't go there again. Experience wasn't what you'd hoped for? Now you know. Value wasn't there for the money? Live and learn. But this time? I was pissed. 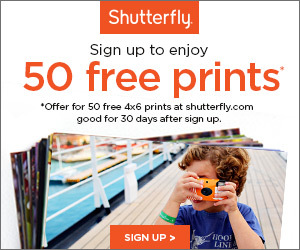 I found the email addresses for both the mall and the photography company and told them the whole story. I didn't make any threats, didn't demand anything in return, just vented out this whole story. How frustrated we were with the incompetence of the people who posed our young kids far, far before they were ready to take their picture. The rudeness we encountered when we tried to calm Reagan. The inability create a flow that worked well for the photographers and the kids. How disappointed we were with this highly publicized "event" when we'd been so happy with the standard experience at our usual mall. And I'm happy to report that both places immediately reached out to make things right. First, we were immediately given our gift card. Then the photography company offered us a complimentary Santa picture at our usual mall. One we actually go to every year without complaint. 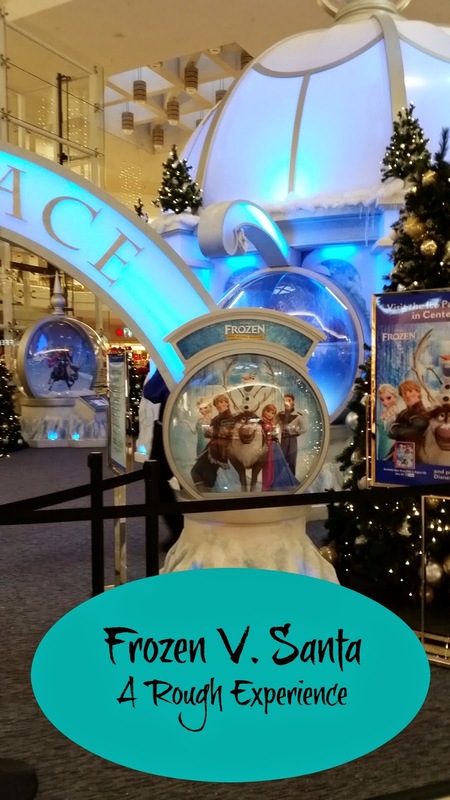 Finally the mall with the Frozen experience offered us another chance (which was nice, but not worth the drive). We took our gift card. We visited our "regular" Santa. And we got a great picture. Keep it simple. Adding all these extra Frozen bells and whistles to Santa didn't make it better. If you want to have a Frozen castle, do it. But combining with Santa? Not so much. We know better and won't be doing one of those again. If we run into a Frozen/Santa hybrid and the girls are truly dying to walk along the blue ice road, we'll be one of those smart families who skip all photographs and leave happy. When complaining, tell your story, but stay positive. Don't make demands. Don't threaten to trash them. All you need to say are the facts. Here's my story. I was disappointed because usually you're great. I thought you ought to know. And above all, don't let it wreck the day. If you ask Madison what she loved most about this whole, highly anticipated, Frozen palace visit day, she'll tell you the Disney store. And you know, I'm ok with that. If I'd let my hissy fit get the best of me and we'd left, it would have been a bad day. 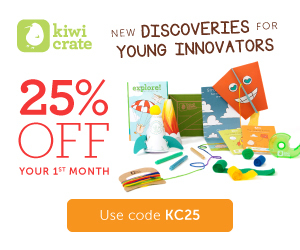 Lessons learned, companies cared, but honestly? I'm glad we've checked Santa off the list! And Santa, I have totally earned a spot on your good list. I want a kitchen that stays clean. Make that happen.